The Whizz Whip lets you operate your QRP HF/VHF/UHF portable transceiver with ease ! The unit comes complete with a 130cm telescoping whip antenna with integrated tuner for receiving and transmitting that mounts straight on to your radio. The Whizz Whip releases your rig from coax, cables, mounts, tripods and trees, and gives you amazing performance from your desktop to garden, with no ground required. A total portable solution - finally you can take your portable radio anywhere you like at anytime you like. The Whizz Whip means you're on the air instantly, and working HF and VHF or UHF and ideal marriage to Yeasu's FT-817ND. 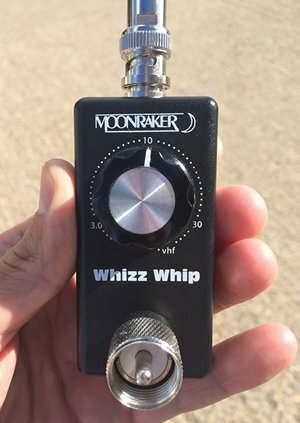 The Whizz Whip is a truly unique design that enables you to transmit and receive all the way from 3.5 to 450 MHz. On HF, the integrated tuner will generally provide an excellent match (better than 2:1) and permit loading the antenna perfectly. On VHF, the antenna may be tuned by fine tuning the whip length in conjunction with the tuner. You can operate the antenna in different modes on VHF and UHF, such as 1/4 wave, 5/8, 3/4 or even 11/4 wavelengths, depending on frequency. The Whizz Whip is perfect for any shack and any rig - for emergencies, testing, field days, cottage, camping, canoeing, fishing etc etc. Wherever your big antenna won't go, the Whizz Whip puts you on the air. It is also a superb SWL and scanning antenna too. The antenna's C-VAT tuning does a spectacular job on reception. Far more selective and noise-free than many active antennas. It provides a tuned impedance match to your receiver's front end and you can use it with random wires, rubber ducks or even small dipoles.